Home/Tips & Techniques/Is Milk Paint and Chalk Paint the Same Thing? Is Milk Paint and Chalk Paint the Same Thing? A lot of people use the terms chalk paint and milk paint interchangeably as if they were the same thing. Meanwhile, others are unsure about how they are different. Although they do share many similarities, there are some important differences between the two. So, today we thought we would compare the two. Milk paint and chalk paint are both valued by interior designers and homeowners for their ease of use, versatility, and as outstanding alternatives to traditional paint. They dry quickly, are ideal for use indoors, and can be used on a wide variety of surfaces, including wood, drywall, plaster, and masonry. In most cases, there’s no need to use a primer or sand the previous surface before applying milk or chalk paint. Both forms of paint be applied as an opaque color or a thin wash. Chalk paint and milk paint can be applied using brushes, rollers, or sprayers. Milk paint has been around for centuries. It’s comprised of lime, clay, milk protein, and pigment. Colonial settlers used milk paints in their homes when traveling painters would go from town to town with their stock of natural pigments and use lime from the local lime pit and milk from the farmer’s goat or cow to mix their paint. Today’s milk paint hasn’t changed dramatically in its composition, except that powdered milk protein is used instead of goat or cow’s milk. The ingredients are natural, non-toxic, and kid-friendly. For an authentic vintage look, milk paint is an ideal choice. It distresses naturally over time and can flake or chip when applied over finished pieces for an antiqued look. To create an even, consistent, and non-distressed finish, a bonding agent can be applied before painting. A top coat of oil or wax can enhance the finish and durability of milk paint, although it will last a very long time, even without a top coat. Milk paint is a very affordable option, and any leftover paint can be disposed of in your garden as a fertilizer. Although ‘Chalk Paint’ is actually a brand name used by the company that first developed this kind of paint, it is commonly used to refer to all brands of paint that use calcium carbonate and talc as a base. 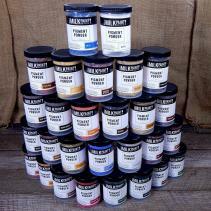 A relative newcomer in the field of paints, chalk paint first hit the market in the 1990s. Predominantly used for furniture, chalk paint provides a matte finish. Creating a crackled or distressed finish is more difficult to achieve with chalk paint. Due to its thicker consistency, chalk paint is not an ideal choice for trim, moldings, or furniture with detailed carvings. To achieve a long-lasting durable finish, several coats of sealer must be applied on top of chalk paint. Although most chalk paints are far more environmentally friendly than traditional oil or acrylic paints, some manufacturers add harsh chemicals. Despite their many similarities, milk paint comes out the winner when you consider it’s affordability, durability, versatility, and convenience. Contact us today to learn more.